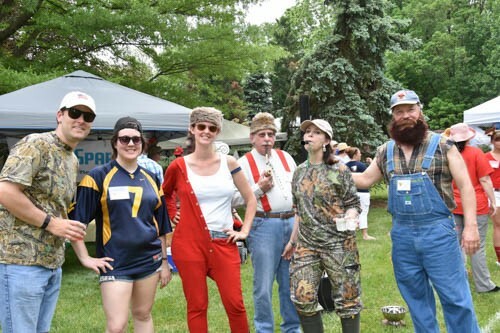 Sticky Wickets Croquet Party - Most Fun Event of Spring 2015! 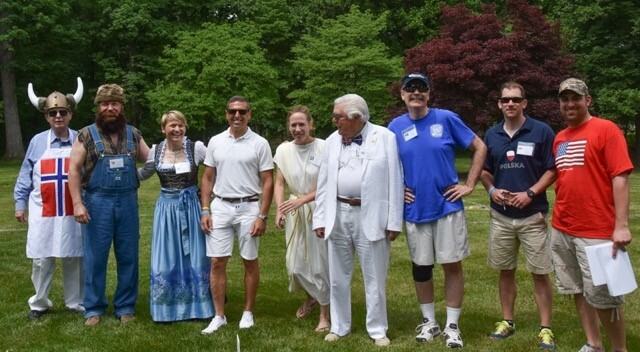 Approximately 100 people gathered on the lawn of a beautiful Leesburg estate wearing wacky costumes and eating/drinking food from around the world while playing in a golf croquet tournament. This unique annual event, sponsored by the Rotary Club of Leesburg, raised almost $12,000 for local Loudoun County charities. 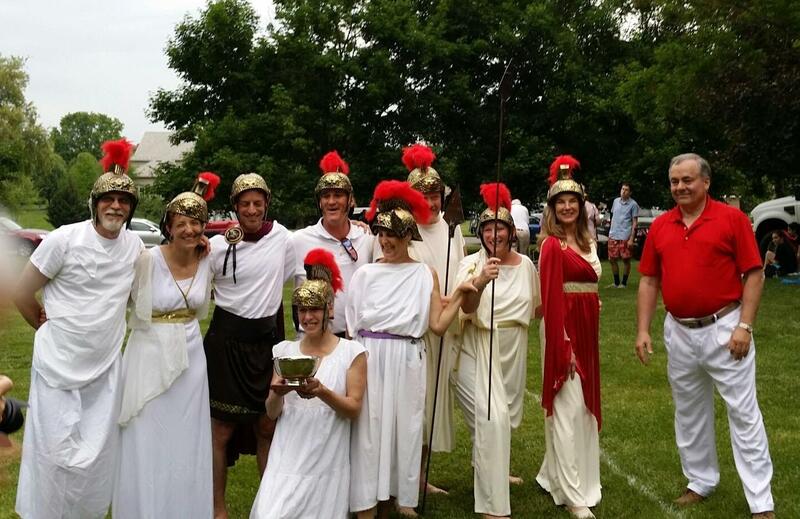 Team Sparta clothed in togas and helmets, led by Kimberly Strassel off Hillsboro, took the wining trophy by defeating the impeccably dressed British team, led by Rotarian Wiley Russell. 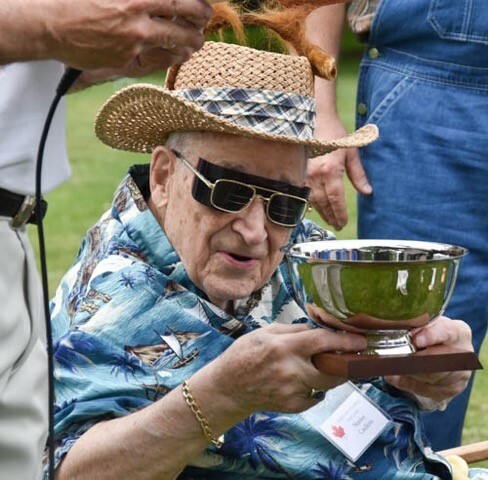 The trophy, called the "Stanley's Cup", was named after local celebrity and Rotarian Stanley Caulkins who was on hand to start the event. Last year's winning team, ECHO, led by Leesburg Daybreak Rotarian Karen Russell, was recognized as were the hosts, Rotarian Jim Gable and Kelly Hymes. Children enjoyed the pool and hot tub, while the adults visited decorated tents to munch when they were not swinging mallets or bidding on auction items. Prizes were awarded for best male and female costumes, most alluring bonnet, best food, best tent decor, and of course, the tournament winners. The event committee was headed by Ron Rogos. The Master of Ceremonies was Ernie Carnevale. Club president Chuck Reavis awarded the winning team and Bob Hauck served as auctioneer. 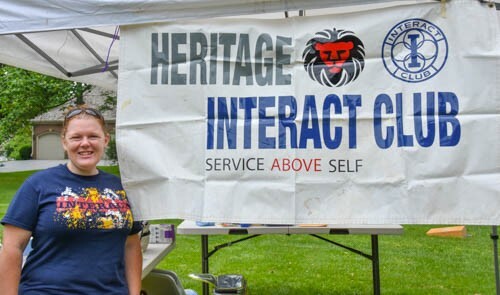 The Rotary Club of Leesburg sponsors the Heritage High School Interact Club whose members ran the children's pool, spa and other activities. Many others were involved since it takes a village to pull off an event so successful and fun.